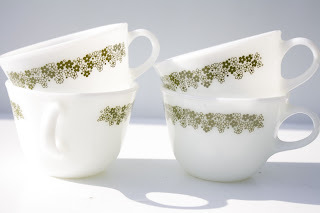 Remember me sharing about my obsession love for vintage Pyrex? In particular, their Crazy Daisy design? I first shared my amazing garage sale steals and then how I completed my set of mixing bowls at the Alameda flea market, but I was never able to track down a complete (and affordable) set of the charming coffee mugs. Until this morning, that is! Call it an impulse buy or love for a great deal, but I snagged a set of four mugs in mint condition for only $14 (that includes shipping) on Etsy! I can't wait to receive them next week. And I can know move on to searching for other sweet finds as my Crazy Daisy collection is finally complete!